Courtesy of Trade Union TV, an interview with Apollo House resident Mitzalo. Working and paying his way up to two months ago, he was forced from his home by the escalation of rents in Dublin city, and managed to find a place in Apollo House before the clampdown on new entrants. A non-drinker and drug-user, he’s found the House to be a safe and usable living space that’s far from the rundown space its landlords and their backers are claiming it to be. Posted in News and tagged Apollo House, stories, Trade Union TV at 10:19 am on January 4, 2017 by Broadsheet. The text here suggests that he is a non-drinker but IS a drug-user. This is what the medium wan is referring to I presume..as he was fairly anti drugs and drink. 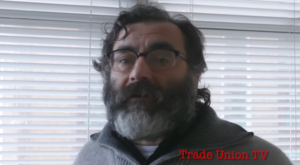 I presume the beard is obligatory if you want to appear on Trade Union TV? “look at the state of that homeless man, a complete scruff” .. you’re unbelievable. we have too many insensitive, clauds like you around, who have no empathy or understanding for anything outside of their own situation. Iv never once heard the owners say it was a run down dump. You must have missed all the talk about the health and safety issues with using that building then. blinded and deafened by his hatred of the poor…. I find my self constantly torn with you. If I answer you, like I am now, il only get beat in a debate. Because idiots like you always drag other people down to their level then beat them with experience. Where in my comment could you actually see anything to assume I hate any one. Is it because you know I’m right. Show me where it was printed, televised, posted by the owner actually saying it was a run down dump. It didnt happen. The words RUN DOWN DUMP were not used. You must hate being wrong, Your telling me that you actually read a direct, word for word sentence from the owner saying “Its a run down dump”. Again when did they say a run down dump. I mean by your logic, priory hall must have been a run down kip. You know because of the health and safety issuse. “Rossa Fanning SC, for the receivers, told the High Court this afternoon that due to the occupation the building, which has been vacant since mid-2015, it no longer has fire insurance and that its public liability insurance will lapse on in mid-January unless the receivers are able to regain possession. Again no use of the words run down dump. No the post said they called it a dump. Hang on, is “Mitzalo” even Irish? Barnabas isn’t a very Irish name either. The poor guy, he seems like a thoroughly decent bloke. Extortionate landlords made this man homeless only 3 months ago! Now he has no job. Reallly, what kind of country is this? Ireland is screwed if it doesn’t sort out this mess. Why don’t his embassy offer him a flight ‘home’? or why don’t we the taxpayer do that? Why don’t you take a flight somewhere and stay there? Isn’t he the Head of the CIA in Homeland? You killed my father, prepare to die..
Apollo house is like a gated community for a small section of the homeless population who fit their requirements. They exclude anyone who may have mental health or addiction issues and then boast about the utopia they have created. it’s not unusual for a homeless service to not cater for certain residents with high needs and there are a variety of specialist services to support those residents elsewhere.